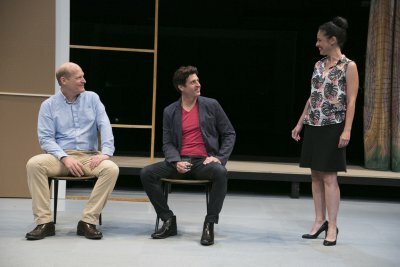 Theatre for a New Audience has opened its 2015-16 season with a return engagement of the New York City Players production of Richard Maxwell’s Isolde which appeared at the Abrons Arts Center in April 2014 for a limited run. TFANA appears to be his most mainstream venue in his New York career. Maxwell both writes and directs, and in recent years he has made use of the members of a company he founded called New York City Players which specializes in his plays. Experimental playwright/director Maxwell has a uniquely personal vision of theater. He has said in interviews that he directs his actors to be “neutral,” in other words all emotions are drained from the performances. Only the subtext tells us what they are feeling. His characters never seem to finish their sentences. Questions are left dangling. Much information is withheld. The play pulsates with unspoken tensions. He makes use of traditional forms and archetypes but explodes them partly by avoiding our expectations. Isolde, which uses the Arthurian legend of Tristan and Isolde for its underpinnings, is absorbing theater. However, you will either find it pretentious or brilliant depending on what you want from a theatrical experience. Like the Arthurian legend, Maxwell’s Isolde contains a love triangle but the story is overlaid with other problems. Isolde, a famous and beloved actress is losing her memory as a result of an undisclosed illness. Her caring husband Patrick, a building contractor, arranges for her to build her dream house to distract her from her problems. She hires celebrity architect Massimo with whom she begins a torrid affair. The affair appears to distract Massimo from finishing his work. When the plans for the new house never seem to get drawn, Patrick calls Massimo on it, and then brings in his thuggish friend and colleague Uncle Jerry to meet him. Eventually they all reach a stalemate. While the play uses the form of the drawing room drama and is mainly set in Patrick and Isolde’s living room somewhere in the country by a lake, the unfinished sentences and thoughts undercut this now dated theatrical form. We learn little about the characters from what they say and they always seem to be fencing verbally. The set by Sacha Van Riel with its few plywood walls and ordinary chairs suggests both an unfinished room being built as well as a rehearsal studio where actors might spend their days. In the opening scene, Isolde is attempting to run lines with her husband for a play that appears to be based on the Arthurian legend. The next to the last scene with the four characters in medieval costumes becomes a very brief silent summary of the legend with Patrick as King Mark, the betrayed husband, and Uncle Jerry as Melot sent to fight Tristan. However, this scene seems both extraneous and beside the point: the play has made this summary both obvious and unnecessary. The one element that Maxwell as director (and his cast of actors with whom he has worked many times) makes tremendous use of is the palpable tension. 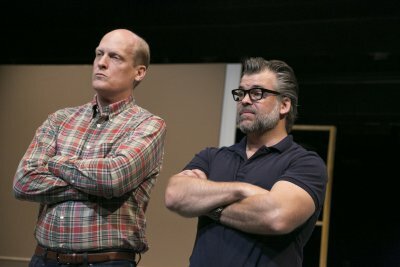 While the characters never quite say what they mean and the threats are left hanging in the air, the temperature continues to rise throughout this short play. 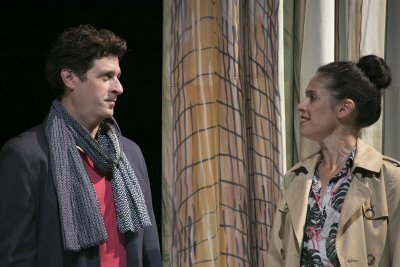 In the title role, Tory Vazquez remains an enigma as Isolde, though she navigates a middle course between her husband who is her support and her lover whom she admires as a fellow artist. As her husband, Jim Fletcher is like one of those Pinter characters who seem to challenge with every cryptic remark they make. Gary Wilmes reveals little as the lover and always seems to be on the verge of laughing, as he plays it close to the vest with his two unknowable clients. Brian Mendes’ Uncle Jerry says the least but always remains a sinister character who one suspects could cause great physical harm. The nondescript costumes (except for Isolde’s many outfits) are the work of Romy Springsguth, with additional costumes by Kaye Voyce. Richard Maxwell’s Isolde is a chance to see this notable experimental theater artist at work with actors who are fully attuned to his vision. While Isolde is never boring, its omissions may frustrate the theatergoer who looks for answers. Those who appreciate being challenged will find it a fascinating experience. However, it is not a concept for everyone.